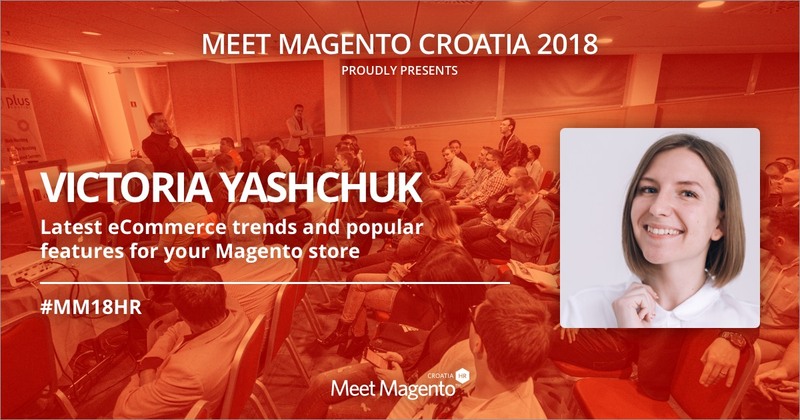 Victoria Yashchuk from Atwix is coming to #MM18HR stage and is ready to discuss “Latest eCommerce trends and popular features for your Magento store” – Meet Magento Hrvatska 2018. Victoria is a Magento Solution Specialist and a project manager at Atwix whose greatest joy comes from working with others. She is coming to Meet Magento to share her thoughts on the “Latest eCommerce trends and popular features for your Magento store” which is why we are recommending this presentation to both business owners and developers. Before Magento became a big part of her life she tried many different things like singing, dancing, writing, and teaching, but not to reveal everything she said, read it in the interview. Hi Victoria! I have the custom to ask each and every one of our speakers to tell us a bit more about themselves and I won’t make an exception now. Feel free to tell us anything, it doesn’t have to be work-related. Hi Borna, first of all, thank you for this great opportunity to be a part of Meet Magento Croatia. I can’t wait to come to Osijek. The right beginning might be that I was into new technologies right from my youth, but that’s not true. 🙂 Although, I was always very active and tried different things – from singing in the choir and dancing to being a part of the European Youth Parliament. After participating in EYP, I understood that working with people brings me the most joy and especially working in a team. It also helped me when I started managing my team at Atwix. I believe that everything is possible when you set a clear goal for yourself and your team and….do not forget about the small steps towards it. I have stumbled upon your Tumblr page victoriaspoems and I have to say that those are some lovely poems (can say for the part I got from the google translate) but it seems like you stopped. Is it just that you don’t find time to write or are you just keeping them for yourself? Thank you! I am thrilled you liked the poems (at least the translated ones) 🙂 To be honest, I was not very active in Tumblr and did not post the new ones for a long time. But, I am still writing and always find the inspiration in my everyday life. Hopefully, someday there will be enough poems for a book. By the look of it, from the moment you got your bachelor’s degree you got a job at Atwix. Since you are a Magento Solution Specialist my guess is that your work is mostly related to Magento. What do you find so appealing around Magento? Well, it is almost right. Before Atwix I was also working as an English tutor and was going to become an International analyst. My future occupation was closer to politics rather than e-commerce but as years passed I decided to try myself as a project manager instead. Magento is the main focus in Atwix and from the day one – I fully dived into it. First big pros of Magento is definitely the community, I’ve already been to Magento Imagine twice and the atmosphere is just amazing there. Each success and failure story is a great learning experience and there is definitely a lot to learn about Magento. For those who will not be able to participate at MM18HR, could you give them a glimpse of the topic that you are going to talk about? My talk will be about the latest e-commerce trends. Those would be the things which can add this WOW effect to the website and make it stand out among the others in 2018 and 2019. A lot of them were also the most requested features from my real life projects. We live in a very creative time and simply to sell the products does not work anymore, we should surprise, inspire and deliver the personal experience every single day. Don’t miss this great opportunity to visit Osijek and enjoy our hospitality combined with awesome #MM18HR conference! Click HERE to see the rest of the speakers and their presentations.